“A total of 30 patients with high levels of chronic and treatment-resistant depression were enrolled in the study. Patients were randomly assigned to receive a single injection of Botox or a single injection of saline placebo (“fake treatment”). Related studies concluded that facial expressions and emotions are linked. This means that changing either the emotion or the facial expression can influence the other, as whatever one does with her face transmits feelings back to her brain. A cosmetic surgery in Baltimore, such as a facelift, can have the effect of removing tell-tale signs of anger or sadness on the face, such as the sagging around the middle part. 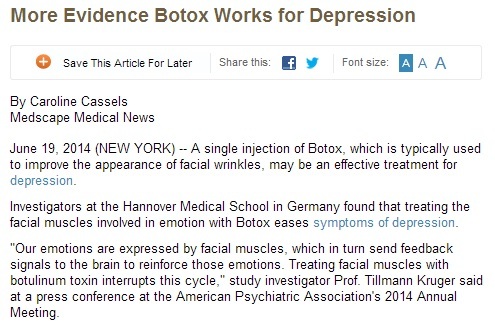 Those who are looking for a less invasive solution, however, can turn to Botox. As Botox acts to paralyze facial muscles that are responsible for expressions of anger or sadness, it also prevents the transmittal of these emotions to the brain. Beyond its potential ability to treat depression, it is undeniable that this procedure can improve a person’s mood and self-confidence by improving the patient’s appearance. An enhanced self-esteem is a manifestation of recovery from the depression that may have been brought on by the thought of losing one’s youth and vitality. The psychological benefits of Botox may thus be traced not only to the correlation of bodily systems, but also to the uplifting effects of an improved appearance. Those who wish to find out if they are good candidates for the procedure should consult a highly skilled doctor who is adept at performing cosmetic surgery in Baltimore, such as Jerry Schreiber, MD of the Baltimore Plastic and Cosmetic Surgery Center.